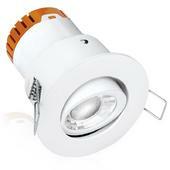 The new E5™ and established E8™ fixed and adjustable fire rated downlights set new levels in performance. Featuring the sparkling low glare multifaceted EnFiniti™ lens and delivering up to 390lm from 4.5W version and 640lm from 8W. The E5™ and E8™ are packed with features and benefits which allow for a quick and cost effective installation while still providing users with optimum performance and energy saving LED technology. Please note that the Bezel is sold separately.